My research manager turned up this gem in the course of answering a question I had about the popular response to the introduction of the telegraph in the US (a moment that informs the working title of my next book). 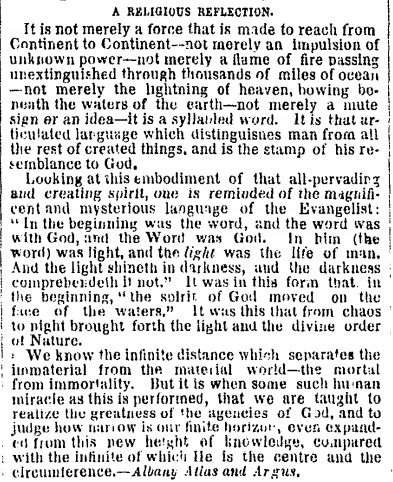 What I find fascinating is how the invention incited an innate religious response (this editorial from a local Albany, NY newspaper is in no way unique). The logic goes something like this: Mankind has invented something that pushes the boundaries of our comprehension – we are now doing something that once was understood to be the provenance only of God. Therefore, we must remind ourselves that this invention, while seeming to contradict the supreme powers of God, in fact only reinforces His position in our world. But in the intervening centuries, we’ve come to realize that God isn’t going to provide an operating manual for the power we’ve unlocked, and if we’re going to get our arms around it, it’s on us to do so. We can’t throw up our hands and hope for the best. We have to shoulder the responsibility of entering these new realms of power. That’s why I change Morse’s famous quote for my working title: What We Hath Wrought. Two centuries after that first electronic message pierced time and space, what will we have built? That’s the question my book will explore, using the tools of anthropology and journalism, and a bit of luck along the way. *Indeed, the story of Morse’s precursor Claude Chappe, the inventor of the “optical telegraph,” offers additional pathos to the narrative. Raised “in church service,” Chappe chose an entrepreneurial path, developing a series of signal towers across France in the late 1790s. His first test message declared a far more earthly intention: “If you succeed, you will bask in glory.” But Chappe died ingloriously: He threw himself down a well in despair at accusations his invention was stolen from the military. one human brain per second,” they write. Our total storage capacity is the same as an adult human’s DNA. And there are several billion humans on the planet. Yep. Read Kurzweil or Kelly, all this is discussed as about to be eclipsed. And then…will anyone notice? I’m waiting to find out. We’re still pretty incredible creations…I’m sure we’ll figure out how to use all this incredible technology to mindlessly entertain ourselves! yes I am certain of that as well! There’s a book called “The Victorian Internet” by Tom Standage published in 1998 that you may find interesting. For sure, on my list. Thanks. Sorta apt as it was World Radio Day on 12 Feb, and here in Australia I heard a program about a cat named Henry Sutton, who claimed he built the first radio. The program has been rebroadcast a couple of times this week on our public broadcaster and also covers Australia’s telegraphic history, the move from cable transmission to beam wireless, etc, etc. A World Radio Day special on Ballarat’s legendary inventor Henry Sutton and a claim he built the world’s first portable radio; a new biography promises to upturn the recognised history of Australian telecommunications and reveal century-old secrets of his work for the Australian Navy.